Front-Firing 12" Long-Throw Powered Subwoofer. Front-Firing 12" Long-Throw Powered Subwoofer with state-of-the-art BASH amplifier. Sensitivity: 110dB @ 30Hz. Add impact to your favorite movies and full-bodied bass to your favorite tunes. It features a high-current, 250-watt amp which effortlessly drives its down-firing 6.5" woofer for dynamic low-frequency effects. 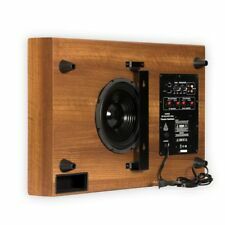 When you want your bass down low, you need a subwoofer as part of your home audio/theater system. Monoprice has the basses covered with this 12 inch, 150 watt (RMS) Powered Subwoofer model! This 12" sub is capable of producing 150 watts RMS (200 watts peak) output. It has a frequency response range of 50 to 250 Hz with a low-pass crossover filter, which can be adjusted through the full range. Gain and frequency knobs on the control panel allow you to adjust the crossover filter and the power output for the optimum blend and balance of bass output with your stereo or surround speakers. 2 Available -- Multiple Shipping Discount !!! SAMSUNG PS-FW1-2 SUBWOOFER ONLY Brand New. Condition is New. Shipped with USPS Priority Mail. Model: SUB180. The unit is in perfect working condition. There is a scratch on the front (see pics). Add impact to your favorite movies and full-bodied bass to your favorite tunes. It features a high-current, 500-watt amp which effortlessly drives its down-firing 12" woofer for dynamic low-frequency effects. LG S33A1-D Wireless Bluetooth Active Subwoofer - 40W Black. Condition is LikeNew. Shipped with USPS Priority Mail. Item has some signs of being moved around but other then that, cosmetically it looks like it’s practically new. Still has the original stickers on the front of the speaker from the manufacturer. Item has been tested and is 100% functional. Everything pictured is what is included, just the speaker. If you have any questions please message me, thanks! Rockford Fosgate P300-12 Subwoofer - Black. Rockford Fosgate Punch P300-12 Single 12" subwoofer enclosure with 300-watt amp. Rockford Fosgate P30012. Rigid, Smittybilt, ARB, Westin and hundreds more! Support USA Brand | 60 Days Return | Fast Delivery! Pair with one or two Echo (2nd Gen) or Echo Plus (2nd Gen) devices to add deep bass to your music. 100W RMS power; integrated amplifier; 6" woofer; 30-200Hz frequency response; wireless connectivity. Sonos Sub Wireless Subwoofer - Black. Condition is Used. Shipped with UPS Ground. Perfect working condition. Minimal scratches. Features: Bass Reflex. Subwoofer Type: Active. Minimum Frequency Response: 28 Hz. Maximum Frequency Response: 200 Hz. Color: Black. Instruction Manual. Weight (Approximate): 25.35 lb. 300Wrms BASH® amplifier. 11" Polyglass Woofer. Active bass reflex subwoofer. this is in super nice shape and super clean and works great. 16.7kg (36.8lbs). Shipped with USPS Parcel Select Ground.its open box item. Great unit, easy to hide and tuck under a piece of furniture. I have upgraded my system and no longer use this unit. Still works Great! This is in amazing condition. You will not be disappointed (but your neighbors might!). Aiwa TS-W50U Powered Active Subwoofer Speaker System . Condition is used and unit definitely shows wear as you can see in photos. Scratches to plastic housing and scuffed edges of top side wooden housing. Has a missing switch for Auto Power in the back. Unit powers on and delivers an awesome low frequency sound. We will assist you in providing any information needed. · Pictures are of the actual item. Sonos Sub Wireless Subwoofer - Black. Condition is New. Shipped with USPS Parcel Select Ground. The Klipsch R-100SW subwoofer delivers incredibly deep bass via a 10" front-firing driver featuring a spun-copper IMG woofer and all digital amplifier. Powered by Solid Commerce The [All-in-One Listing, Inventory & Order Management Solution ] (https://pages.ebay.com/seller-center/listing-and-marketing/third-party-listing-tools.html#solid-commerce) for Online Merchants Protect Your Product With a Consumer Priority Service Warranty. (2)12" 2000W Subwoofers SDC-1240. 2" High Temperature CCAW High SPL Voice Coil. 40 oz Magnet. Frequency Response: 25 Hz to 1.5 KHz. include all parts and accessories. International Priority and after a 24 to 48 hour processing period. Cambridge Audio Ensemble I subwoofer. Operational condition is good - I pulled the grill and verified the surround is intact, produces the kind of sound that you expect from an Ensemble system. Cosmetics are as per the pictures: some edges / corners distressed, though not fatally and per expectations for a vintage system. Shipped with USPS Priority Mail. Details: Strong deep bass down to 28Hz at 80W RMS with 0.8% distortion maximum. New speaker cloth installed, internals inspected and cleaned, fully tested and working perfectly. Flexible input connections with either one RCA Subwoofer / LFE input with variable crossover or speaker wire inputs with pass through. SONY SUBWOOFER SPEAKER SONY SA-WMSP85 100W Tested Working. SONY SUBWOOFER SPEAKER SONY SA-WMSP85 100W Tested Working.. Condition is Used. Shipped with USPS Parcel Select Ground. Solid subwoofer in perfect working order. Cosmetically, minor nicks and scratches, as seen in pictures. Please let me know if you have any questions and thank you for your interest. Condition is Used. Has power cord but no remote. Used a universal remote. Barely used. Subwoofer will be double Boxed. Snell Basis 300. 10" 4ohm sub subwoofer. Condition is Used. 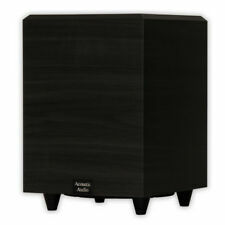 REL Acoustics T5/i Subwoofer in Gloss Piano Black - Mint One Owner! 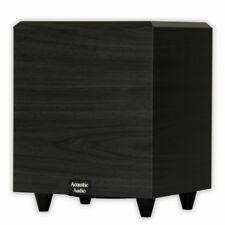 REL T-5i Subwoofer for sale in piano gloss black. Seldom used. Sonos Sub Wireless Subwoofer - Black. Condition is Used. sub works great! Cosmetically very good shape. it has the circular felt feet stuck on the side, as the original owner had the sub under their bed. Ships in Sonos factory box! Shipped with USPS Parcel Select Ground. Advanced YST (Yamaha Servo Technology) for Powerful Bas Response. Advanced Yamaha Active Servo Processing Subwoofer. Two Input Connections: Speaker Level or Line Level. Upon receiving your inquiry, I’m sure we can work out any issues amicably.